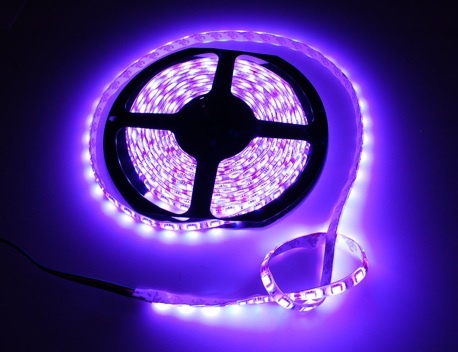 NEW PRODUCT – RGB LED waterproof flexi-strip 60 LED « Adafruit Industries – Makers, hackers, artists, designers and engineers! 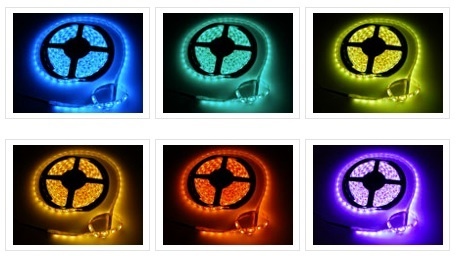 NEW PRODUCT – RGB LED waterproof flexi-strip 60 LED – These LED strips are fun and glowy. There are 60 RGB LEDs per meter – twice as many as our other strip, and you can control the entire strip at once with any microcontroller and three transistors. The way they are wired, you will need a 9-12VDC power supply and then ground the R/G/B pins to turn on the three colors. Use any NPN or N-channel MOSFET (although the big powerful kind is good for a large strip) and PWM the inputs for color-mixing. We splurged and got the waterproof kind with white background color. There’s a 3M adhesive strip on the back which should stick to most smooth surfaces. Great for decorating your bike or art project, costuming or funky fashion. You can cut this stuff pretty easily with wire cutters, there are cut-lines every 5cm (3 LEDs each), and trim off the waterproof cover with a hobby knife. Solder to the 0.1″ copper pads and you’re good to go. The 60-LED strips use twice as much power and look twice as good! They come in 5 meter reels with 0.1″ molexy connectors, and are sold by the meter! If you buy 5m at a time, you’ll get full reels. If you buy less than 5m, you’ll get a single strip, but it will be a cut piece from a reel which may or may not have a connector on it. We have a full tutorial with details, diagrams, schematics and code for using your RGB LED strip, please check it out!